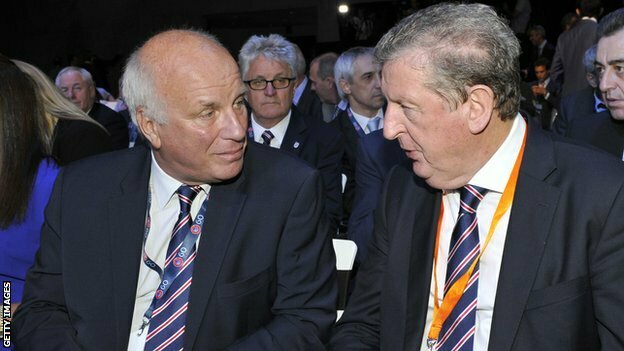 England boss Roy Hodgson is “up there” with the likes of predecessor Sir Bobby Robson, according to Football Association chairman Greg Dyke. Hodgson, 68, will be taking England to the Euro 2016 finals in France this summer and is also celebrating 40 years in management. He has taken charge of four national sides and 16 teams in eight countries, including Liverpool and Inter Milan. “Roy is a great example to any aspiring coach that being open to new experiences and cultures can really develop you as a person. Robson was England manager between 1982 and 1990, and was in charge when England were beaten on penalties by West Germany in the World Cup semi-final in Italy in 1990. 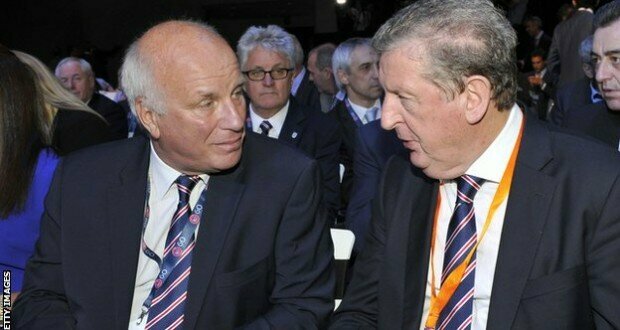 Hodgson ended his playing career, spent largely in the English non-league system, to become a manager at the age of 28. He made an instant impact by winning two titles with Swedish side Halmstad and two more with Malmo. Other highlights include leading Inter Milan to the Uefa Cup final, Fulham to the Europa League final and Switzerland to two major tournaments. He has also been in charge of West Brom, Fulham and Blackburn Rovers in the Premier League, and national sides Switzerland, the United Arab Emirates and Finland.